“Seen anything good”? How many of us have heard that open-ended question while birding in the USA, Canada, and Costa Rica? How many of us aren’t sure how to answer it? Since we all know that what falls into the “good bird” category is relative, I guess you can answer it any way you want. Like if you feel that seeing a friendly chattering House Sparrow was a good bird, then it indeed was. Once upon a time in Niagara Falls, NY, they were to a friend of mine whose name was Sandonato. Sandy was a fifty-something guy who had immigrated to the Falls from Campobasso, Italy. He had a heart of gold, you could see it in his eyes. With that same glee, he told me how he enjoyed watching the sparrows in his garden, how the males courted the females, fought over seeds, always chattering. He wasn’t a birder but I wouldn’t be surprised if he would have become one if he had lived longer. He saw the beauty in all living things, it’s easy to become a birder when you already have that going for you. I suspect that all of his birds would have been “good” ones, everything from Blue Jays to Northern Cardinals and Blackburnian Warblers. Rock Dove? That might be pushing it, maybe even for Sandy! I suppose if you can call a Rock Dove a good bird, then you can officially claim that you do indeed love and appreciate all things feathered but until then, don’t feel bad about limiting the “good bird” title to lifers, rarities, and colorful species like the Bay-headed Tanager. It’s like someone took turquoise, beryl, and other semi-precious gems and brought them to life. 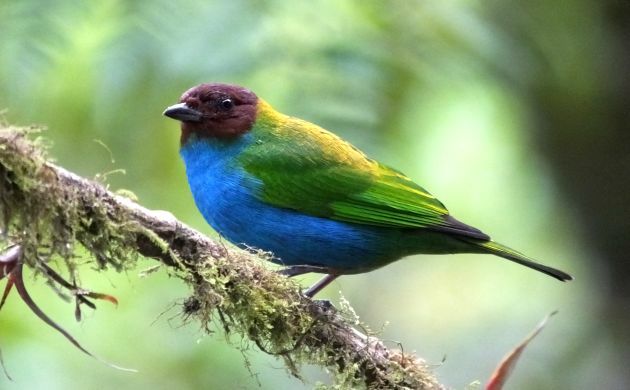 Although a friend of mine and I didn’t see any Bay-headed Tanager action during a recent visit to a hotel off the main birding circuit called, “Lands in Love“, we still had some good birds and by that, I suppose I mean species that are either uncommon, rare, unexpected, or just super cool. With a definition like that, you are always going to see good birds, especially in Costa Rica, but read on and you can decide for yourself if the birding was “good”. The birding day began under cloudy skies over the forested foothills of the Tilaran Mountains. Grateful that the rains had stopped, we entered the trails at Lands in Love and were eventually treated to the rising whistles of Thicket Antpittas, Black-throated Wrens, and Dusky Antbirds. A Black-headed Tody-Flycatcher chipped from the canopy and a Black-faced Antthrush whistled from the forest floor but most birds remained hidden, apparently not so eager to come out and play while the wind rustled the crowns of towering trees. The bird that did show was probably the best; an uncommon, officially Vulnerable and very local Tawny-chested Flycatcher. Uncommonly colorful for a flycatcher, several pairs of this smart little bird are present in the forests of Lands in Love. Further on, the forest mostly kept its quiet secrets although we did manage to hear and see a few Song Wrens, and came across a few mixed flocks of the understory. These are basically groups of drab, sneaky little birds that almost seem invisible as they hasten their way through the lower levels of the forest. Quiet vocalizations and hints of moving leaves reveal their presence. With patience, we eventually got looks at Sulphur-rumped Flycatcher, Tawny-faced Gnatwren, ticking Golden-crowned Warblers, and White-flanked Antwrens. Getting pictures of these naturally cloaked, shy, hyperactive birds is always a feat that tests the limits of both optics and frustration but one or two sometimes stop long enough for the shot. 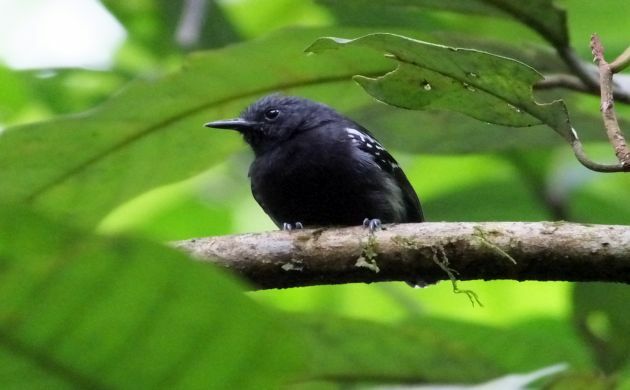 White-flanked Antwren tends to be one of the more cooperative members of the understory flock. In Costa Rica, this one counts as a good bird. Back out on the loop road that passes through Lands in Love, windy skies kept things more or less on the down low although we did manage distant looks at more good birds, this time in the form of soaring Black Hawk-Eagle, White Hawk, and King Vulture. Pishing for warblers turned up less than expected but a Crested Guan non-chalently feeding on palm fruits next to the road was certainly good, and a Sunbittern with egret identity issues was even better! 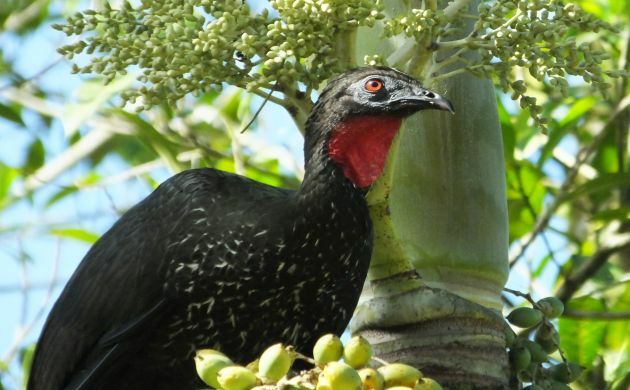 Not a Rock Dove, the one and only Crested Guan! Once it learns that no one is trying to shoot it, this species can be common and tame at many sites in Costa Rica. Now about that Sunbittern… Shortly after the encounter with the guan, we moved forward in the car, hoping to catch up with more bird activity on the higher part of the loop road. 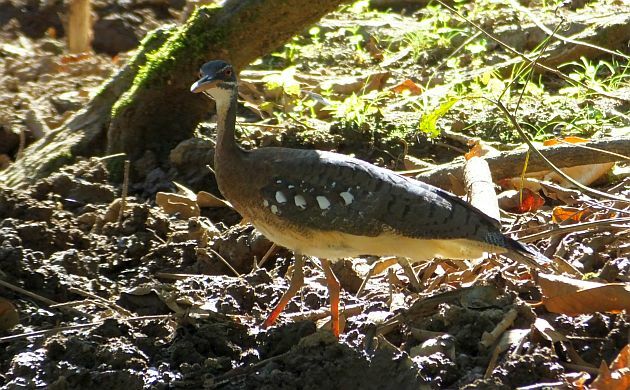 Since I wasn’t really expecting any birds in a large mud puddle in a horse paddock, when a Sunbittern came into view, I suddenly found myself stuttering uncontrollably. 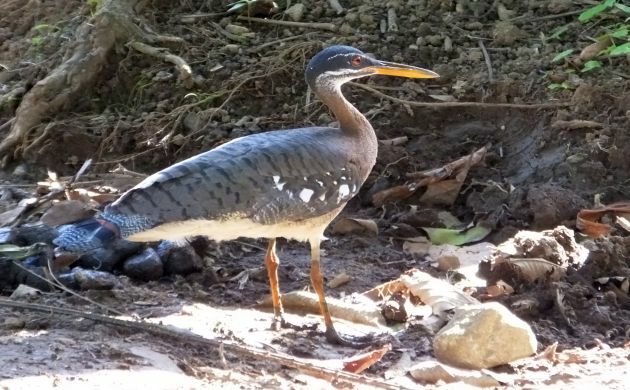 I guess the view of a Sunbittern standing out in the open as if it was a Little Blue Heron is enough to cause a neural short circuit. 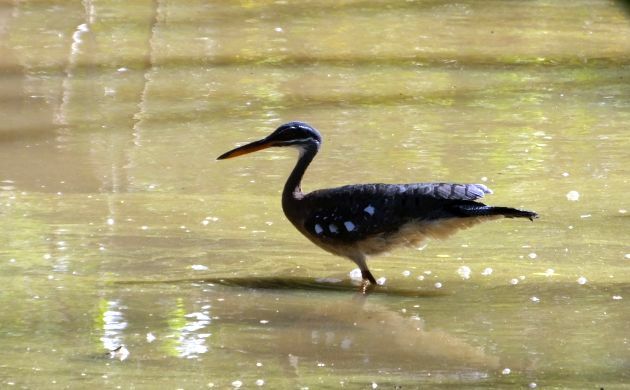 Luckily, before I could get it together and articulate “Sunbittern”, my friend knew what was up and readied her camera to photograph this odd, prize, pseudo wading bird through the window of my car. 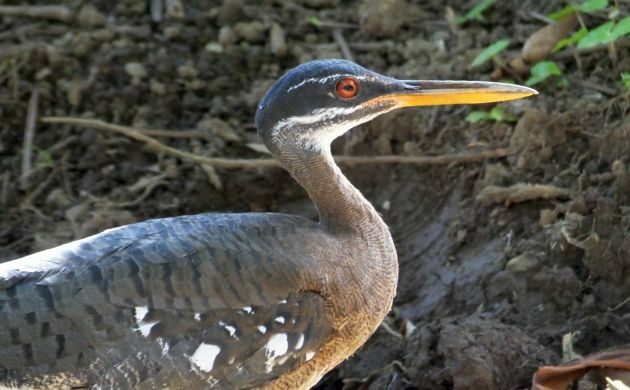 However, as it turned out, there was no need to worry about spooking the Sunbittern because the dude was fearless! After parking the car, we were able to watch it forage in the open for several minutes. Eventually, it sauntered over to our side of the pond and let us take more pictures and admire it as long as we wanted. I guess the only thing it didn’t do was open its wings to flash its eye-shocking sunburst pattern but then again, Little Blue Herons don’t do that and since this bird was obviously trying so hard to be one, well maybe that’s why. We joked about catching tadpoles to feed it, next time I’m bringing the net. Sunbitterns wade, saunter, and slowly sway from side to side. They also apparently sometimes don’t give a crap about anything. This dude was a serious stone cold rock star! I suppose the unbelievably bold Sunbittern was our best bird of the day although everything was good. It was certainly the most memorable bird of the day, I wonder if Sandy would have liked it more than his House Sparrows?